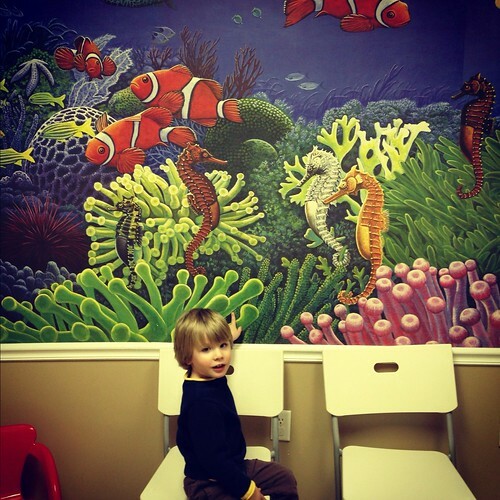 We paid a visit to the pediatrician yesterday. Jude has been snotty-nosed for close to two weeks now, but what preschooler isn’t? And my usual protocol of “just wait it out” typically works pretty well. So he has been running and playing and being his crazy self, and I just figured if there was a problem, I’d know when it happened. I still took him to school since he’s only there 6 hours a week anyhow, and the rules about keeping a kid home just apply to stomach ailments and fevers. Then we arrived at his school yesterday morning, and it smelled like bleach when we walked in the door. I mentioned to his teacher that he was still snotty but seemed to be fine and didn’t worry too much as I left there to run errands. An hour later, the school director called me and said his temp was 99.3, so I should come get him. I did, of course. And I felt pretty lame and embarrassed that I deemed it alright to drop him off and didn’t take his temp that morning. But I gather from our conversation and the overwhelming bleach bath that there have been some pretty nasty bugs going around, so they’re being super strict and watchful. After that we got a quick appointment with the pediatrician, and she gave us an antibiotic and said it was a sinus infection. We made it almost 38 months without an antibiotic in this kid, but there’s a first time for everything, I guess. He’s passed the snot monster off to baby sister, but Dr. B said simply to watch her for fever or changes in behavior, but for now she’s fine. In hindsight we’ve had a full 5 weeks off from sickness in this house, but I really feel like we’ve been passing something around since he started school. SO MANY GERMS. I know the interaction is good for him and the time with only Norah is good for me, but it’s seriously ridiculous. I hope the next three months aren’t as brutal as this season started out to be. All this combined with the news that a mama-friend of mine is sitting bedside in a children’s hospital with her very sick newborn who contracted pneumonia from a simple respiratory virus is turning me in to a germophobe. We also have some light traveling and family get-togethers this weekend, so I’m just praying the kids hold up and we survive intact. We’re trying our hardest to stay in the holiday spirit despite the sniffles. Happy weekend, reader. I’m looking forward to dinner with some college friends tonight and Christmas celebrations tomorrow. Plus lots of car passenger time for knitting! Hope he is feeling better soon. Sinus infections are no fun, I have had my share, and they all start so simply. I too hate to run to the Dr. only to find out that it is nothing, and in the end don’t go when I should. How do we win that game? I don’t know. I feel ya. Greyson has been snotty and coughing upon waking but no fever and no getting worse (it’s gotten a little better). Maybe I’ll take this as my heads up and run him by the doc. Currently insuranceless, so it’ll be a walk-in clinic, but better safe than sorry! I’m also turning into a huge germophobe, but I did realize today that Greyson has been FAR less sick than he would’ve been this time last year, pre-ear tube. Those things are a blessing!